Drivers hit by the jump in gas prices at the pumps this week after the introduction of the carbon tax should brace themselves for even higher prices in the coming months. A combination of higher world oil and an increase in demand for diesel, plus seasonal factors such as the shift from winter to summer gasoline and higher demand in the warmer months means the big drop in prices that started late last year could be a thing of the past. Dan McTeague, senior petroleum analyst at GasBuddy, expects prices to raise another five cents as early as next week as the shift from winter to summer gasoline takes place across much of Eastern Canada. “Ontario, Quebec, and the Maritimes are looking at a net five cent increase on top of Monday’s five cent increase,” McTeague said. That federal carbon levy at $20/tonne that applied in Saskatchewan, Manitoba, Ontario and New Brunswick added about 4.4 cents per litre. B.C. and Alberta already had a carbon tax and their gasoline is refined closer to home, making a difference in when price increases take effect. Susan Bell, oil analyst at IHS Markit, expects gas prices to rise by 10 cents from now to the end of summer as a gasoline inventory glut in the market starts to ease, and crude oil prices head higher, in part due to demand for diesel fuel. The IMO is introducing a sulphur limit rule for 2020, known as IMO 2020, which will decrease the amount of sulphur allowed in the fuel from 3.5 per cent to 0.5 per cent. This will affect large ships that use low grade fuel, which is considered the bottom of the barrel, because of its air-polluting qualities. In order to comply, many ships will likely have to switch to diesel, pushing up demand for heavy crude oil, which is used to make diesel. “International factors such as the International Maritime Organization’s (IMO) global bunker fuel oil specification change will require refiners to increase crude oil runs to meet strong diesel demand,” Bell said. The price of benchmark U.S. crude oil — West Texas Intermediate (WTI) — has surged nearly 47 per cent since hitting a one-year low in December, now trading around $62 US a barrel. Meanwhile, the price of Western Canadian Select (WCS) has quadrupled — jumping more than 300 per cent to around $54 US — since hitting a yearly low in November. Meanwhile, analysts are split over how much of an impact the carbon tax on fuel will have on consumers. McTeague said those shrugging their shoulders over a five cent increase in gas prices this week need to remember that a 2.5 cent per litre increase annually over the next three years will result in gas prices higher by at least 12.5 cents when all is said and done. “When there’s a component that pushes prices up that is discretionary such as the carbon tax, which is a policy decision as opposed to an economic factor, it means that price remains permanently cemented in place, and it will continue to build over the years,” McTeague said. Bell, however, said while higher prices at the pumps will affect the affordability of fuel, the overall impact of the carbon tax is relatively small when compared to the wild swings in the oil market. 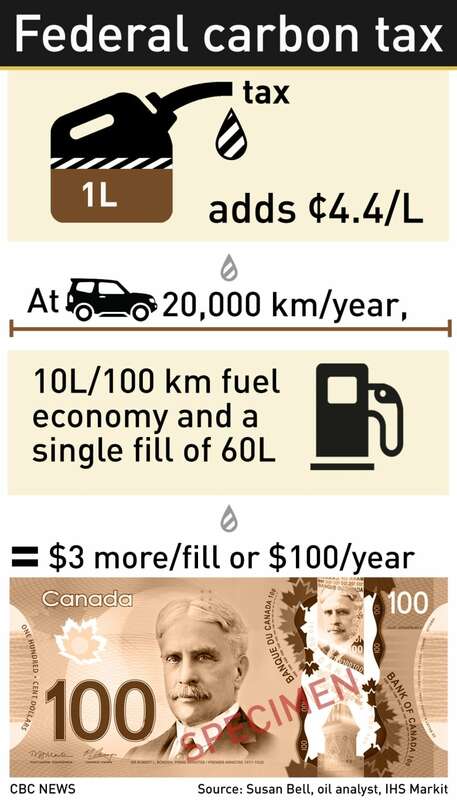 With the carbon tax adding 4.4 cents per litre to the price of fuel, that equates to less than $100 per year of increased cost per vehicle (assuming a typical 20,000 km of driving per year at an average 10 litres/100 km fuel economy). “On a single [gas] fill of 60 litres, the carbon levy is less than $3. So, the overall impact is relatively small,” Bell said.